par l'architecte, Rudy Ricciotti est situé entre la mer et le vieux marché. Naturellement, il ne fait pas l'unanimité car c'est un bâtiment moderne, mais je pense que les mentonnais dans leur majorité sont enclins à dire "Attendons pour voir." 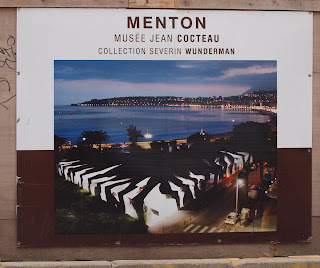 Does Cocteau have a connection to Menton? I am confused about where this is located, Jilly. Is it where the boules courts were located near the muncipal market? I hope the market is still there. It does look very modern for its setting, but then, so did Cocteau! Mark, Yes, Cocteau is very connected to Menton. He stayed here in 1950 to attend our famous classical music festival and to inaugurate the International Painting Biennial. The then Mayor of Menton invited him to decorate the Salle de Marriages at the Town Hall which he did. Then he decorated a large room in the Town Hall itself - these are all frescoes, by the way. In gratitude for this work, the mayor made Cocteau an honorary citizen of Menton. Later Cocteau discovered the old Bastion on the port which he decorated himself and it is now the current Cocteau museum. This will remain and has constantly changing exhibitions of Cocteau's work. It opened in 1966, three years after the death of the artist. Karen, yes, the new building is on the land opposite the market and more or less where the Boules court was. 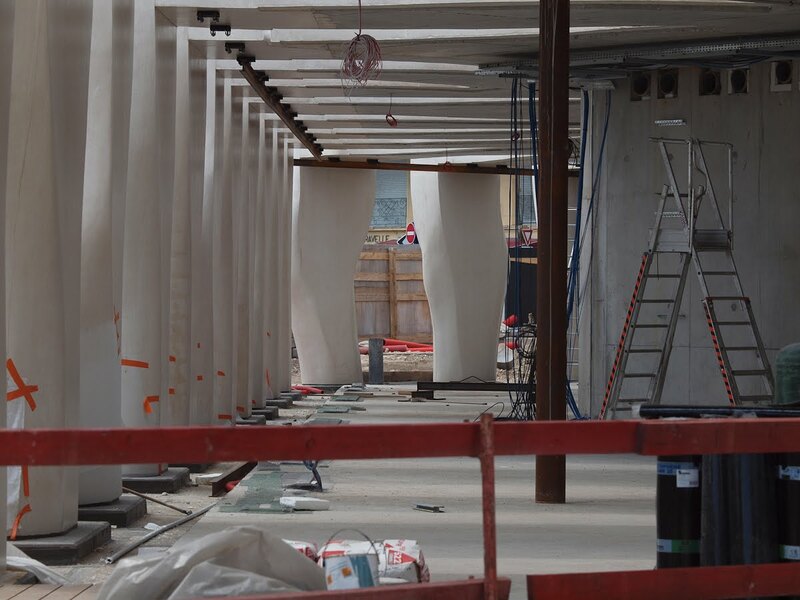 However it is nearer to the far corner of the market (ie the Monaco end) and at the moment, if you stand with the sea behind you you can see the main entrance to the market building - this isn't blocked by the museum, so presumably there will be gardens along there. 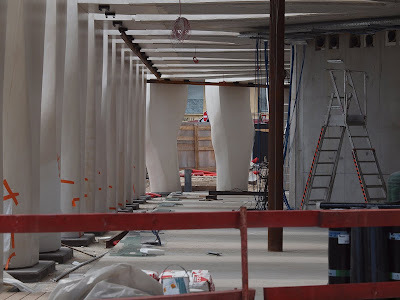 The new museum is a very low building and doesn't interfere with the architecture of the lovely old market although naturally there are people who don't like it. As I said we'll have to wait and see. Thanks for your detailed explanations Jilly. I really like your close-up shot, it's intriguing. Love the way you've gone with your photo today Jilly. When you click on the finished building, it is pretty spectacular. Fascinating photo with this wall in the background. 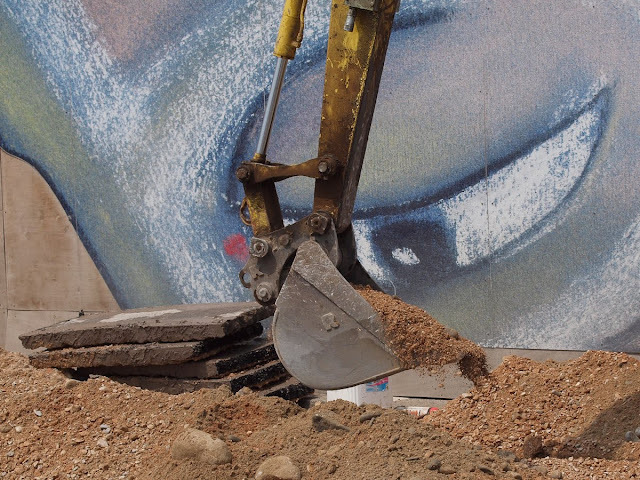 That first shot turns construction into an artform. I like anything this man did. Great capture for theme day. Your top shot is excellent, Jilly. Waiting to see it completed is probably wise. I have changed my mind about buildings that seemed too "different" at first. Fine composition in that top shot Jilly. Interesting text. Can't wait to see it when it's done. Love that first shot. The building is watching intently as it’s surroundings are being remodeled. A really beautiful image. One of the best today. Yes, they should built many more museums! Think we reached 80 museums in Barcelona now. Thanks Jilly, very interesting and sounds like a great museum. I agree with Steffe: you can never please everyone, and indeed, probably should not try as it involves dumbing down to a large extent.